More people are shooting videos with smartphones and tablets. And often they remain trapped there, waiting to be trimmed down, broken into smaller segments or edited into a photo and video montage. If the fear of video editing is keeping you from sharing your captured memories, read on. Video editing is actually drag-and-drop simple through apps on your iOS or Android smartphone or tablet (There are no Windows Phone 7 or BlackBerry apps like these.). The results are polished and you can share directly from your phone or tablet—no computer required. Here are my favorites. The beauty of ReelDirector is its simplicity. When you start a project, you’re prompted to add a title, closing credits and your transitions (you can preview what these will look like). Then you drag and drop your photos and videos onto the timeline. There you can trim them, add text and add your own narration or music. When you’re done, you can upload it to YouTube, email it or save it. It works with any photos and videos you have stored on your iOS device. iMovie doesn’t walk you through creating videos, but its interface is fairly intuitive and if you get stuck the help center covers just about everything. 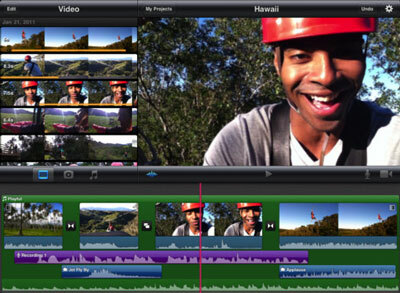 iMovie has themes that add title, transition and music to your video, giving you a polished look without effort. And if the limited selection of titles, transitions and music that comes with the app isn't enough, there are plenty of plug-in apps to provide additional choices. Sharing options include uploading to YouTube, Facebook, Vimeo or CNN iReport, or email. 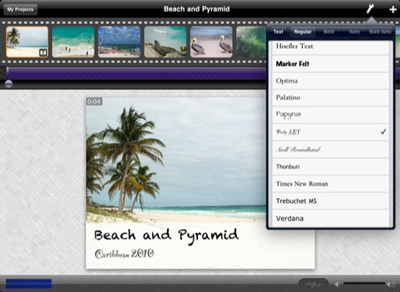 iMovie works with any photos and videos you have stored and is compatible with any iOS device with a front-facing camera. All the elements you need to create a video are clearly laid out in Avid Studio. You just need to drag and drop them onto the timeline. If you want to trim a clip, you simple pull the handles in to the section you want or hit the razor blade where you want to split the clip—by far the easiest of any editor. There’s a cool montage feature, where you can drag-and-drop picture or videos onto one frame, and there’s a nice selection of stationary and motion text titles. However, there’s a very limited selection of transitions and no included music, only what’s in your iTunes library. Since Avid Studio just came out last month, you’ll likely see plug-in apps coming soon. You can export your project for editing in Avid Studio for PC, save it to your device, email it or upload it to YouTube or Facebook. 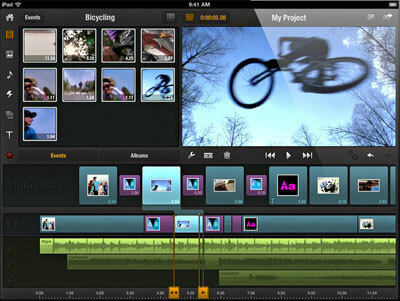 Avid Studio works with any photos and videos you have stored on your iPad (not compatible with iPhone or iPod Touch). None of the video editors for Android are truly intuitive to use, but AndroMedia Video Editor does provide basic functionality for creating videos. Trimming and splitting clips is easy. You can also add titles, transitions, music and record your own voice track. You can share your videos by uploading them to YouTube or Facebook, sending them via text or emailing. The editor works with photos and videos you have stored on your device and is compatible with Android 2.2 (Froyo) and newer devices. As a tech editor myself, I’ve often been asked this same question. The applications mentioned in this article are great for making small movies on your phone by combining clips, adding music, and transitions. But what if users simply want to share a basic 10-second clip of the home-run swing? You don’t want to make it into a production, add music, or stare at your screen more than a moment. Just share and get on with life. To make the clip manageable, you’ll need to trim off the extraneous ends. Movie-making apps are usually overkill and too cumbersome for that. The solution is almost certainly already in your phone; you just need to figure out how to use it. 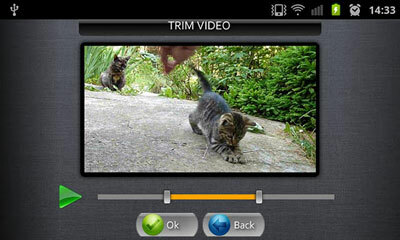 Look for trimming functions in the video or playback mode. If you can’t find them, try doing a quick online search for instructions - it’s worth the effort. Then you can share directly from your device, the same as you would still photos. Alternatively, move the video onto your PC, where it’s easier to edit, given the large screen and mouse. Download the free app RealPlayer, which has one of the simplest free tools for trimming extraneous seconds out of video clips and sharing via YouTube etc. Lastly, think in terms of recording only 10-second video bursts, not longer clips. That will help save a lot of editing in the long run! How to edit on your desk top? Thes eare all phone and ipad apps. My video from my go pro is on my computer. What is the easiest way to edit video that is not on my phone but on my computer? You’re writing from a mac email address so assume you’re editing on a Mac? If that’s the case, I would just go with iMovie. We use it to edit Techlicious videos all the time and, in our experience, it’s far better than any similar Windows movie editing program. If you’re using Windows, Microsoft Live Movie Maker is simple to use (and free).